Imagine you are at the end of a wonderful Tibet tour, wading through the security line at Lhasa Airport or Lhasa Railway, carrying a carefully-selected beautiful Tibetan knife as a present for your loved one at home, probably has spent a small fortune on it too, only to find out that you can’t take it on the flight/train from Lhasa with you. You can avoid this sort of heartbreak over treasured souvenirs by taking the time to review this Tibet tour shopping guidelines – Do not buy Tibetan knives as souvenirs because you cannot carry it with you on a flight/train from Lhasa, nor can you mail it back to your home country. According to local knives carrying restrictions on aircraft and train, travelers cannot pack a Tibetan knife on board of a flight or train. Mailing it can also be a trouble, but some Tibetan souvenir shops offers to have this taken care of. You can buy a Tibetan knife from them if they include the service of mailing of it to your home country. The shop owners are in this business and may have a tried channel to do this. Don’t attempt to do it on your own. More than often you will end up with your Tibetan knife left behind with our Tibetan guides. Tibetan knife was an essential and indispensable accessory in the old days for Tibetans. Tibetans often worn Tibetan knives at their waist. And they use it to cut meat, chop down trees, for self-defense, and also serves as an accessory. 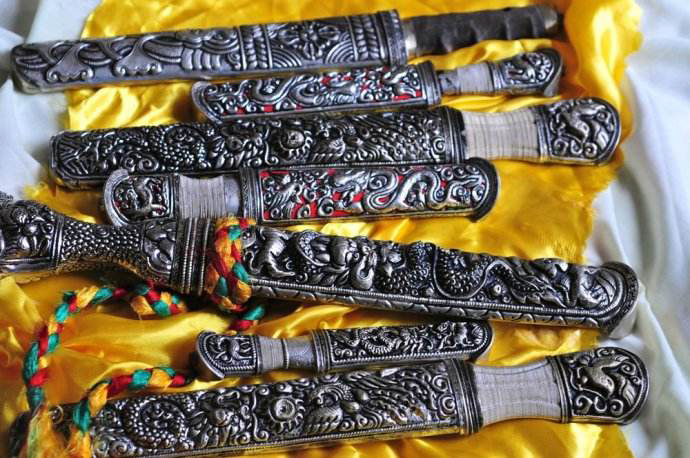 The Tibetan knives have many different sizes and shapes. Its blade is made from delicately processed steel. Its handles are normally made of ox horns, ox bones or wood. Travelers are welcome to contact Tibet Travel Expert via email at [email protected], for more Tibet shopping guidelines. And keep in mind not to purchase Tibetan knives unless you can be sure of that you can bring or mail it back home.